I have always had something of a bias against the "this time it hits close to home" trope in fiction. In detective fiction, I enjoy when cases have personal resonances for our detectives, but generally I don't like when they have actual personal connections. This bias puts a damper on my enjoyment of movie thrillers, where invariably the hero's family is at risk or requires avenging. The most obvious reason for this bias is that it seems pretty improbable and needlessly manipulative. How many times in reality has a detective had to go rogue and solved a case before his colleagues catch up with him because they believe him to be the killer? How many times does the hero cop catch up with the real murderer during the same climactic moment his reticent partner catches up with him? It cannot be a large number. A less obvious reason is that one of the points of a hero is that they do their jobs skillfully and exhaustively even when it is someone else's family at risk, or someone else's wife's murder that needs solving, or someone else's name that needs clearing. The heroic ideal is the person that goes into the burning building to save the person he doesn't know. Part of the joy of a great detective story is that compulsion to make things right that can never be made right again. The sense that they can fulfill an important role that changes things, but doesn't change anything. So, I was disappointed when I saw where the first chapter of Ruling Passion was headed: Detective Pascoe and now-girlfriend Ellie Soper arrive late for a weekend reunion with out of town college friends only to discover three of their friends savagely murdered, and the fourth missing. This is the third outing for Detective Superintendent Dalziel and his Sergeant Pascoe1, and Pascoe here is out of his beat, functioning as a shocked and troubled witness rather than an investigator. Dalziel almost doesn't figure in the first third of the novel; he is working away on a string of robberies. The partnership between the two heros is disrupted, and Pascoe's role is disrupted. Despite my bias, Hill kept me moving, and this outing is in fact the best in the series so far. Pascoe profited from the fish-out-of-water routine, with trenchant observation on his position as a policeman but not an investigator. Pascoe also reflects on grief and shock eloquently (though the voice feels more authorial here), and Hill's writing-in-the-small is tremendous. As with the last novel, the writing-in-the-large stretches credibility. In An Advancement of Learning, I was more forgiving of this: the character work was stellar, and the characters and the setting largely felt very real. Only the logic of the crime was incredible, and you cut yourself off from too much detective fiction if you cannot forgive a preposterous crime2. Or perhaps the problem is that the interactions and reflections of our three series characters (Dalziel, Pascoe and Ellie) are so interesting that you indulge the actual crime investigations only grudgingly. There is murder, fraud, robbery, a suicide attempt and likely more here, and naturally all of it is somewhat implausibly connected, though mercifully not in an "evil genius" or conspiratorial manner. It is interesting enough, incredible but not fantastical, but you shortly wish he would get back to the scuffling between our heros. The highlight of the book and the low point of the book both rotate around Ellie Soper, Pascoe's girlfriend. The highlight is the introduction of the relationship between Dalziel and Ellie, a relationship of rambunctious tensions. Hill knows these characters intimately, and the reader feels that he only has to put them in a room or on the phone together to have their interactions appear on the page. Dalziel is coarse, meticulously thoughtless, and chauvinist largely for the charm of provocation. Ellie is a strong, smart "modern" young woman3, self-possessed but only casually combative. Dalziel forces an upper hand in an early encounter with a shock attack, but a rematch over beer is endearing in its dance of mutual restraint. The low point brings us back around to our "this time it hits close to home" trope. If you venture into this territory to generate drama and develop characters, you have to take all the characters along for the ride. Pascoe's reaction to finding his friends brutally murdered is moderately believable: he is a policeman, and he is inured to some aspects of the shock. Grief falls over him, and the combination of the familiar shock and the unfamiliar shock is handled well in the early story. Ellie has little preparation for such a shock, and is whisked away and sedated. Her shock and trauma has moments of reality, but for the purposes of his story, Hill is forced to let it melt away much too quickly. Tough though she may be, the stroll from the bloody scene of a massacre to a sparring banter session in a pub is surely a long one. In this regard, as with some of the writing around the crime, Hill is writing a detective novel from a generation earlier: the body is found, and shortly tea will be served in the drawing room. That can all be forgiven of authors 80 years ago and of authors today, but I can't so easily forgive taking one character on one journey of discovery while another quickly slides through a trap door into her own expedient developments at great odds with reality. I've been promised that Hill's novels keep getting better and better, and so far this is deeply affirmed. Hill is getting brave with his characters, and while I think he overreached a bit here, the bravery keeps things moving forward. 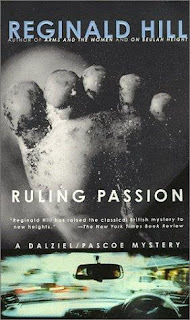 I reviewed An Advancement of Learning previously, the second Dalziel and Pascoe novel. The preposterous murder is perhaps the great tradition of detective fiction, from the exotic poison snake in the sock drawer to the tampered parachute. Hill's murders themselves are realistic so far in the series: firearms or blunt force trauma, usually unpremeditated. It is the scenarios around the murders that are generally the issue, mostly, in my opinion, the challenge with motives. Written as it was in 1973, Ellie isn't remotely contemporary, but she is largely written as progressive for the time, thus "modern".